While cleaning out my craft drawer the other day I came across some fabric fall leaves I used for a project last year. My tot has really been into stringing beads lately and figured we could combine the two into a simple and beautiful autumn art activity. Stringing beads actually benefits fine-motor skills and encourages the understanding of mathematical concepts such as patterns and addition and subtraction. While your child is making this lovely fall project, she can explore color combinations and counting the beads on each string – or the whole mobile! And if you don’t have silk leaves hanging around, real leaves will work, too. Just use extra-gentle hands while creating. 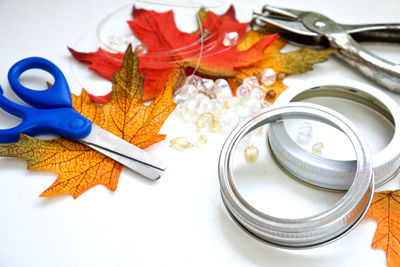 Gather the materials needed for the mobile including silk fall leaves, fishing line, mason jar lids (just the outside rings), scissors, colorful beads, and a whole punch. 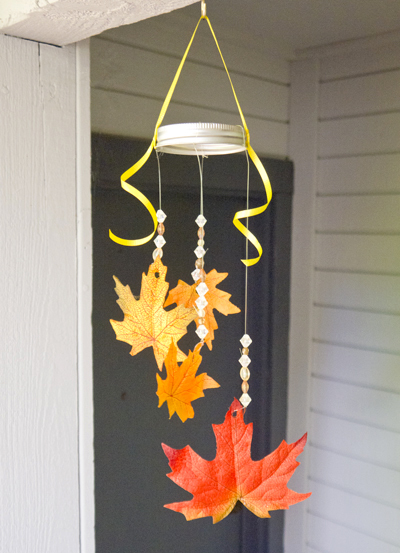 Now your child can brainstorm combinations of beads and leaves she’d like for her fall leaf mobile. Next she can punch holes in the leaves and string with a one to two foot length of fishing line, securing with a knot. Help younger kids by tying on the leaves and then handing over for your child to string with beads. Invite your child to string on as many, or as few, beads as she’d like. She can create patterns, single lengths of colors, or random combinations. When the lengths are finished, she can tie them onto the mason lid. About four or five beaded leaf strings creates a nicely balanced mobile. Finish things off with a one to two foot piece of ribbon or twine for hanging in an entry way or corner of a room. Your child can continue stringing and beading more fall leaf mobiles and hang them all together for a really stunning autumnal display or give to friends and family as gifts! What a fantastic idea… ideal for little hands. Finished product looks good too! Sarah…I just tried a sample one of this for a classroom project but am having trouble with the mason jar lid because when I tie on the ribbon the lid keeps tipping & not staying flat like yours. What am I doing wrong? Mary – try holding the ribbon in place with a dot of hot glue, which will make it easier to balance the lid when you add the next ribbon to the lid. It’s all about getting everything balanced when making mobiles (which can be part of the fun — or the frustration!). Hopefully that helps!